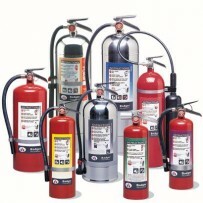 We are proud to be a Badger Fire Extinguisher Distributor; and being a full service company, we are able to properly service and maintain almost all Brands, using OEM parts as required. All of our equipment meet and exceed local and state minimum standards. Our knowledgeable staff can ensure both safety and code compliance. By also maintaining your service records, we make sure your equipment will always be ready when needed and prevent your equipment from becoming non-compliant/out of date so that your OSHA and business license inspections go as smoothly as possible. In addition, all of our technicians are factory trained and are licensed by the state and certified in their fields. This ensures our technicians are knowledgeable of current code in each jurisdiction which allows them to make sure your fire extinguishers and signs are placed where they should be in order to keep them in compliance. We can also test, inspect and maintain emergency lighting equipment making sure they are working properly.